There are few greater joys in a parent’s life than seeing their baby start pulling themselves to their feet. Your baby usually starts trying to walk between the nine month and one-year mark, though some take a bit longer, while some start a touch earlier. You’ll see the sign of impending walking as your baby develops their muscles and coordination. Sitting, rolling, and crawling all show that your baby is getting there. It’s at this point that new moms often wonder what they can do to help their babies along. I think baby walkers offer a good solution. 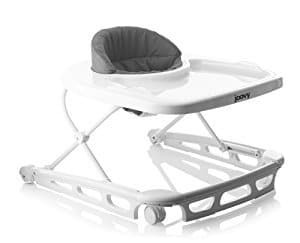 They provide comfort and stability as your baby develops, plus many have extra features to keep your baby entertained. I experimented with a few baby walkers when raising my little ones, and I’ve also spoken to a few parents who made different choices to me. Below are ten walkers that I think will keep your baby entertained and help their development. If you’re looking for a catch-all baby walker, the Discovery Walker may be a good choice for you. As a seated walker, it offers plenty of padding that keeps your baby comfortable while they explore. You can also remove the seat and pop it into the washing machine. I particularly like this walker’s interactive elements. It has a dinosaur theme, with the walker plays several sounds to keep your baby entertained. You also receive a set of five dinosaur toys, which help your baby develop their motor skills as they walk. You can adjust the height to keep up with your baby’s growth, and the plastic parts offer enough sturdiness to withstand tugging and hitting. I also like how easily it folds down, which makes it one of the more portable baby walkers on this list. Finally, the toy tray swings out to reveal a flat tray for feeding time. What's Great About It: The Discovery Walker offers portability and an easily washable seat. It keeps your baby comfortable, and has plenty of dinosaur-themed toys to entertain them. I like the Joovy Spoon Walker because it keeps things simple. It’s a seated walker with a plush chair that your baby will feel comfortable in. The chair is also machine-washable. However, the large tray is the standout feature. While the walker may not have all of the toys and accessories that other walkers have, the tray is big enough to hold both your baby’s toys and meals. There are also no little crevices that your baby could get their fingers stuck in. You can adjust the walker to three different heights, though even the tallest of these may not be big enough for taller babies. I particularly like the lack of bisphenol A (BPA), PVC, and phthalates in the plastics. You won’t have to worry about the effects that these potentially dangerous chemicals could have on your baby’s development. What's Great About It: This walker keeps things simple, which gives you more control over the toys your baby plays with. It contains no harmful plastic chemicals, and has a big tray. If you’re a car enthusiast who wants to pass your passion on to your children, this walker may be a good choice. The Combi walker has a gorgeous convertible car design, with a steering wheel for your baby to play with. It’s also available in several colors, including pink, blue, and red. The seat contains polyurethane foam, which makes it comfortable on your baby’s behind. However, I couldn’t find a way to remove it, so I don’t think it is machine washable. Nevertheless, I found it’s pretty easy to keep clean with wet wipes. The walker has three height settings, and it’s very sturdy. The car design also offers protection in case your baby directs it into a wall. I also love how the car folds out into a flat tray for meal times, almost like a Transformer. What's Great About It: I like the design and how Combi has implemented various toys and mirrors into the car. 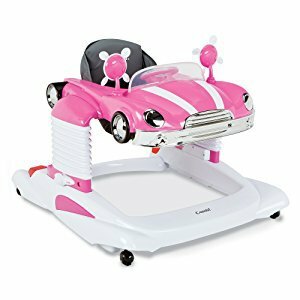 It’s also solidly built, plus the car folds into a large tray for meal times or when your baby wants to play with other toys. Unlike the other walkers I’ve looked at so far, this walker doesn’t feature a seat. As a result, it may not be a good choice for babies who can’t stand comfortably on their own yet. However, the lack of a seat helps muscle development as your baby enters the later stages of learning how to walk. The walker has a lot of bright primary colors, which hold your baby’s attention. There’s also plenty going on at the front of the walker. The spinning panels and sliding toys develop your baby’s motor skills, and give them something to play with when they’re not walking. I’m always wary about stability with seat-less walkers, so I was happy to see that this walker has big wheels. These lower the probability of the walker slipping out from under your baby as they walk. They’re sturdy too, and roll easily over most surfaces. What's Great About It: This may be a good walker for children who can stand independently. It develops leg muscles, and features five toys that develop your baby’s motor skills. Furthermore, its big wheels improve stability. If you’re stuck between the choice of seated and standing walkers, Kolcraft’s Walker may be a good choice. You can convert it from a seated walker into a standing one easily. This offers more variety for your baby, plus it means that the walker adjusts as your baby’s leg muscles develop. I particularly like the seat pad, as it is easily removable and is machine washable. It also features adjustable height settings. However, the walker may not suit your needs if your baby is taller than 32 inches. 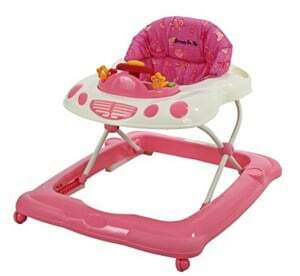 The walker also has several toys, which your baby can access in both the seated and standing positions. These include a flower with a small mirror and a ball for your baby to bat at. I particularly like the sliding toy because it develops fine motor skills. 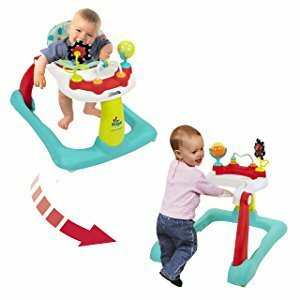 What's Great About It: I like how this walker allows your baby to play with their toys, even when it’s in the standing position. The fact that it converts offers longevity, plus it’s safe to use on most surfaces. Delta’s walker has a similar car design to Combi’s, except that it has a larger seat. I particularly like the seat’s backrest, which supports your baby’s back as they play. The walker has a car dashboard that features a steering wheel and lever. Both of these toys give your baby something to grab onto, which develops their motor skills. The various tugging motions these toys encourage also build arm strength as your baby plays. What's Great About It: This is a sturdy and safe walker that car enthusiasts will love. The dashboard toys develop your baby’s motor skills, and keep them interested with its sounds and lights. It also carries several safety certifications. 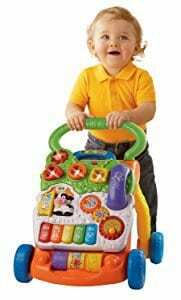 With its array of toys, this walker may be a good choice for spurring mental as well as physical development. The toy tray features rollers, buttons, a telephone, piano keys, and several other pieces for your baby to pull, push, and grab. It also plays 70 sounds, including songs and speech snippets. It’s a standing walker, but the wide base and big wheels ensure stability. I also found that the wheels turn easily on carpets, though they may struggle with shag rugs. You can also adjust the wheel speed, so you won’t have to worry about the walker running away with beginners. I particularly like how you can remove the toy panel, as this gives the product longevity. Once your baby has outgrown the walker, you can still use the toy panel to keep them entertained. You will need two AA batteries for the play panel, which V-Tech has included in the package. I’m a bit unsure about the light weight, as this may make it easier for your baby to push the walker over. 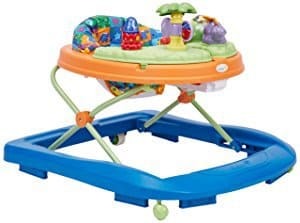 What's Great About It: Longevity is the key here, as your baby can enjoy the walker and toy panel for several years. I also like the sheer amount of things packed into the toy panel, and the 70 sound samples. 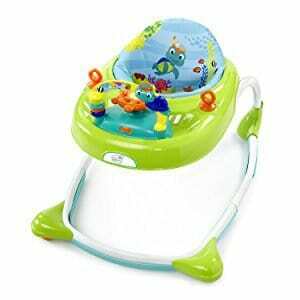 With its aquatic theme, the Baby Einstein walker may be ideal for introducing your baby to marine life. 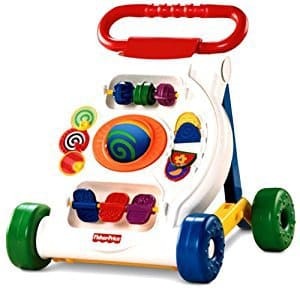 The tray contains a play center, which features a steering wheel and some loops to attach other toys to. It also plays sounds as your baby interacts with it. I particularly like the elliptical base, which makes this walker stand out from most other walkers. It’s sturdy, stable, and easy to assemble too. 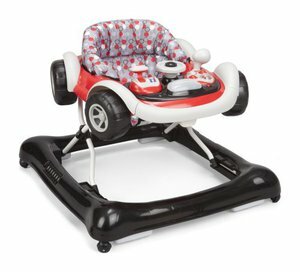 The front wheels turn easily on hard surfaces, which may make this a good choice for adventurous babies. I’m also impressed with the high seat, which offers back support and comfort to your baby. You can remove the toy tray too, meaning that you can use this walker as a feeding table during meal times. ​Though it has three height settings, you may find that this walker doesn’t suit smaller babies. I also found that it struggled to move as freely as it should on carpet, plus the battery compartment is quite hard to get to. What's Great About It: The steering wheel and toy tray offer your baby plenty to grip onto, which develops their motor skills. I also like that you can attach some of your baby’s favorite toys to the tray. The seat offers good back support too. Available in several colors, including pink, blue, and red, Dream On Me’s walker is simple and compact. It features a small toy tray with a steering wheel, buttons, and a small knob for twisting. I also like the car design, though it’s more understated than with similar walkers. Portability is a plus point, as the walker folds almost completely flat. It also has plenty of lights and sounds, which will keep your baby engaged as they walk and play. I particularly like the natural element in the sound snippets. It’s suitable for babies weighing up to 30 pounds, and you can adjust the seat to one of three height settings. What's Great About It: This walker is compact and easy to store when not in use. 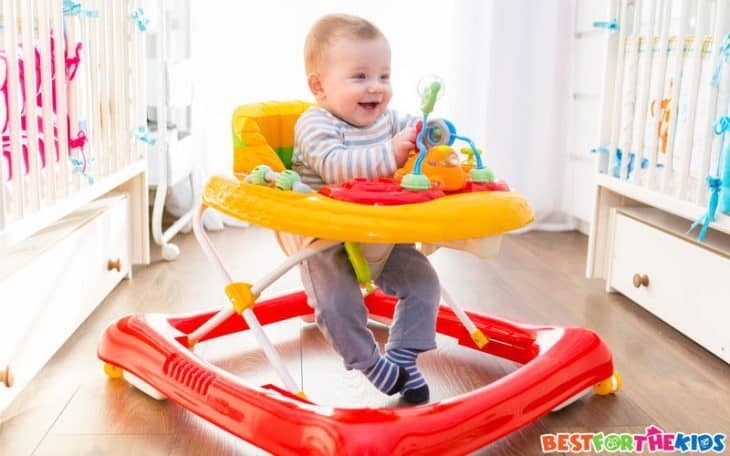 The toy tray helps your baby develop their motor skills, and the seat offers good back support. It’s also sturdy enough to handle your baby’s bouncing. 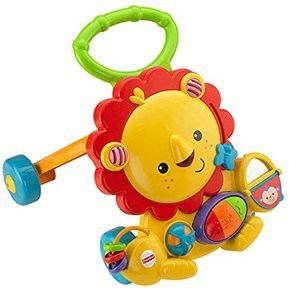 The Musical Lion Walker impressed me with how well it incorporates its toys into the lion design. You’ll find sliding discs on the side, buttons, and a twisty knob, all of which develop your baby’s motor skills. In total, it has eight activities and toys for your baby to play with. The walker also plays sounds and lights up when your baby pushes it. I particularly like the lion’s roar noise, as it meshes well with the design. The handle on this walker stands out too, as it has a textured design that makes it easy to grip. What's Great About It: I was impressed with the detail on the friendly lion design, and how well the walker incorporates its toys into the package. The handle’s design improves your baby’s grip, while the wide base keeps the walker stable. Some may tell you that you don’t need a baby walker to encourage your little one to get on their feet, but I find that they provide great value for money. Improved balance is the main benefit. Without a walker, your baby may fall over a lot when trying to get on their feet. Seated walkers keep your baby stable, while standing walkers have handles to keep your baby upright. You have a choice between seated and standing walkers for your baby. Each has individual benefits, so you must consider what your baby needs most from their walker. Seated walkers are more versatile thanks to their trays. Most allow you to remove the toy tray, creating a flat tray that’s great for feeding times. The seat also offers support for babies who can’t carry their own weight when standing. Standing walkers challenge your baby more, so you may prefer them if you want to teach your baby how to stand on their own. However, some standing walkers have their toy trays at the front. This means your baby can’t walk and play at the same time. Portability is generally not a defining point, as both types of walkers usually fold up for storage. However, you’ll often find that standing walkers cost a little less than seated ones, most likely due to the less complex design. Of course, there are some convertible walkers that offer the best of both worlds. Each of the baby walkers that I have looked at has something different to bring to the table. But I also think there are common must-have features that all baby walkers need in order to stand out. I’ll break these down based on whether the feature is for a standing walker, seated walker, or both. I believe that every baby needs a walker to spur on their physical development. Some of the best examples combine this muscle development with toys that develop fine motor skills. This may offer longevity for when your baby no longer needs the walker. Baby walkers also offer independent play opportunities. While you should supervise your baby at all times, a good walker helps your baby to entertain themselves. Any exhausted parents out there may see that alone as worth the price of the purchase. When choosing a baby walker, think about how it will help your baby’s development. Seated walkers may be the best option if your baby has just started crawling, whereas standing walkers may prove more beneficial if your baby can stand independently. You also need to think about the items on the toy tray as well as the stability of the walker.